My library card is amazing. I walk into the library, pick a book, scan my card, scan the book, and walk out without ever having to interact with a real person. Who needs real people when you have books? 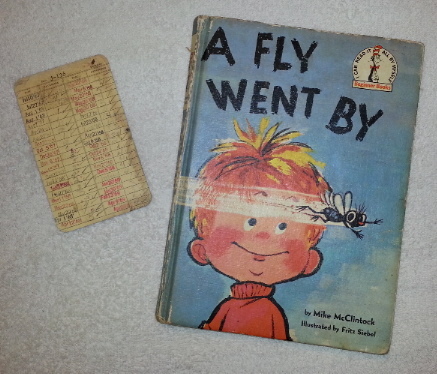 When my Mother passed away, we found in her estate my first book — A Fly Went By by Mike McClintock, Illustrated by Fritz Siebel. I remember reading and rereading that book. The book is falling apart. My Mother also kept my first library card. On the card are stamped the due dates for dozens and dozens of my childhood library checkouts. The card reminded me of my hometown Carnegie library, the stately grandeur of the building, the smell of the books, the quiet. That library card with all the dates on it revived scores of memories. Our modern library cards cannot do that in the same way, but I hope they will renew some memories when decades from now someone finds their childhood library card amongst their Mother’s keepsakes.